USD football decided to forego the annual spring football game due to DakotaDome renovations. Instead, the team held two practices open to the public on April 6 and 14. Head coach Bob Nielson and Athletic Director Dave Herbster came to the conclusion for no spring football game, which is usually held in April. 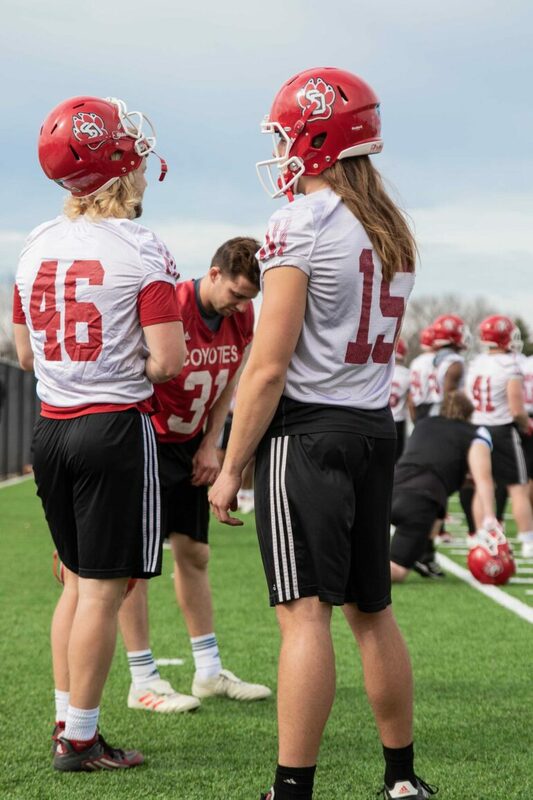 While Nielson sees the value in practicing over a spring game, senior defensive end Darin Greenfield and junior wide receiver Levi Falck have differing views. Falck and Greenfield also had different reactions when they learned there would be no spring game. Greenfield, limited in the last couple of springs, looked forward to this spring. Falck, on the other hand, prefers the practice turf over the Dome turf. Greenfield and Falck agreed the spring game is much more valuable for the younger players rather than veterans who played in the fall. Greenfield, as a senior, knows he’s on his final stretch of his time with USD football. No spring game takes away an opportunity for him and all of the seniors to pad up and play again, but Greenfield acknowledged he still has one season to go.